This chapter explains how to track working time in InLoox. The system automatically assigns the effort to the project plan and stores a separate cost record. 1. Open an already existing project. 2. In the project open the Start tab and click on Time to open the time tracking view of your project. 3. The time tracking view shows all time tracking entries of a specific project. To create a new time tracking entry, click on New. Date and Duration: Define start and end of your entry. 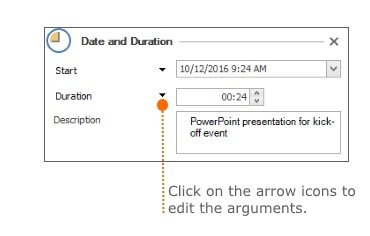 Therefor you can use arguments like Start, End and Duration. Additionally, you can add a description of the activity you were working on. Allocation: Assign the time tracking entry to a specific task or an activity. If you assign it to an activity, the drop-down-list will represent the structure of the planning. 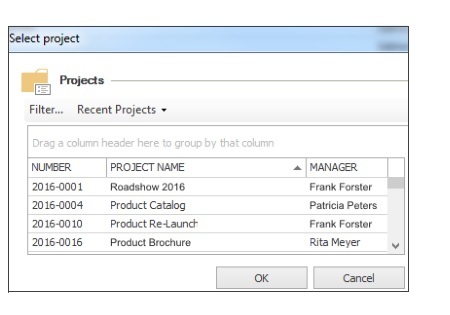 Assign a cost group to the entry by editing the field Group. Details: Mark the new time tracking entry with a green, yellow or red flag and choose the resource that performed the activity or task. Documents: Add additional documents, if needed. 5. When you have added all important facts, close the side panel by clicking on X directly next to Date and Duration in the right corner. Your changes have been saved already. 6. To edit an already existing time tracking entry, double-click on the entry in the time tracking view of your project. Alternatively, select the entry in the time tracking list and click on Edit on the Edit tab. The side panel will open on the right side and you can edit the information of the entry you have selected. Then close the side panel and your changes will be saved. 1. Open the InLoox now or InLoox PM tab and click on Time, to access the time tracking overview for all projects. 2. This time tracking overview contains all time tracking entries of all projects. 3. In the Start tab click on New Entry, to create a new time tracking entry. 4. A dialog box will open. To assign the new entry to a project, select the project in the dialog box and click on OK.
5. Add all information in the dialog box New Item. Follow the procedure that is described above in Create and edit time tracking entries within a project in 4. 6. When you have added all information, click on OK.
7. To edit an already existing time tracking entry, double-click on the entry in the time tracking overview. Alternatively, you can select it in the list and click on Edit in the Start tab. The dialog box Edit Item will open and you edit the information of the entry. Afterwards click on OK. Create and edit time tracking entries | InLoox 9 for Outlook • Copyright 1999-2019 © InLoox, Inc. All rights reserved.